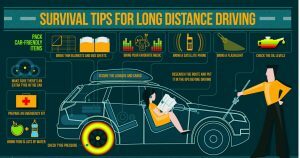 The goal of long distance driving is to get to your destination safely. We all know someone who says, “The time to get there is usually six hours; I did it in four and a half!” Speed should not be your primary focus. If you focus on getting there in the fastest amount of time, mistakes and errors in judgment can be made. 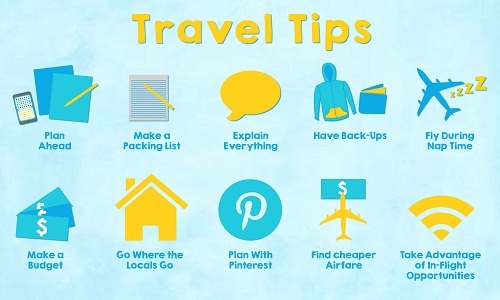 Here are five tips to reach your destination in one piece. 1. Have a Current AAA Plus Membership Card with you. This annual membership provides 24-hour roadside service. The regular card will only transport your car to the nearest repair shop, give a battery charge, or change a tire for a fee of under $50. The AAA Plus card provides additional services. They will tow you for 100 miles for free, a definite convenience for long distance driving. The AAA plus also allows free fuel service, and a $750 traffic accident continuation trip if you are 50 miles or more from home. 2. Do Not Use Cruise Control. Long distance driving can have a hypnotic and fatiguing effect. Cruise control emphasizes and enhances that effect. Especially if you are tired, cruise control’s ability to stay at the same speed can quickly lull you into sleep. Your eyes can close at that critical moment when traffic slows down, and you’re still driving at 70 miles per hour. Lose control of the car, and you have an accident waiting to happen. Drive the car on your own so you can speed up or stop at a moment’s notice as needed. 3. Don’t Eat Heavy Food during the trip. You are going to be sitting and stationary for several hours at a time. Fast food in your stomach will give you a bloated and heavy feeling. Heavy and greasy food like double cheeseburgers, French fries, pizza, fried chicken and biscuits will contribute to the desire to take a nap. Better to eat light food like salads, soup, fruit cups and juice during the trip to keep your head clear. Coffee or hot chocolate is always a safe bet for long distance driving. 4. Stop and Get Rest in a Safe Place. Contrary to popular belief, boyfriends and husbands, long distance driving demands frequent rest stops. Fatigue can overtake you quickly, especially if you only watch the road in front of you instead of taking in the scenery while you drive. Be aware of overall discomfort, muscle aches in the neck, arms and shoulders. This is your body telling you it needs a break. When your tank is half empty, take bathroom and gasoline breaks at the same time. Stop in the refreshment area, walk around, clear your head, get some food, and then take a nap. Never park in the outskirts of a rest stop; park near another car or truck. Parking next to a van with a traveling family is always a safe bet. Park in front of a fast food restaurant, and then go to sleep. You may be surprised to see another driver next to your car doing the same thing! 5. Listen to Fast, Upbeat Music. This is not the time to listen to classical music or talk radio. Unless the topic is something that excites you, talk radio can lower your alertness. Instead, listen to upbeat music, especially anything that makes you want to sing along. Play music you haven’t heard before, like Hip Hop, Salsa, or Reggae. Change the radio station whenever you reach a new state. Bring some tapes you enjoy, or have a tape made of fast, stimulating music just for your long distance drives. Long distance driving can and should be a fun experience. The quality of the drive should be better than the quantity of arriving at your destination quickly, but exhausted. Use these tips on your next trip, and see the change in your driving attitude.